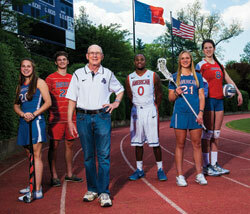 An endowment gift to American University today provides a brighter picture for our future. When you make a donation to our endowment, you give a gift with both immediate and long-term benefits. Endowment donations are invested. A portion of the annual income from the investment is used to address immediate needs at AU. The remaining funds are reinvested to ensure indefinite support. Ted Ringelheim is perhaps busier in retirement than he was during his working days, and the former Alexandria Public Schools employee’s own alma mater remains an important part of his social calendar. After attending an AU men’s basketball game in 2001 at the invitation of the alumni association, Ringelheim, a sports nut and a history buff, has become one of AU Athletics' biggest cheerleaders. He’s a regular in the stands at basketball games and volleyball matches, and hits the field himself as a second baseman with the Northern Virginia Senior Softball league. An avid bowler and Washington Nationals’ season ticket holder, Ringelheim—a former social studies teacher and guidance counselor—also exercises his mind, auditing AU history course with Professor Peter Kuznick and other AU faculty. In appreciation of those who shaped his AU experience, as both a student and an alumnus, Ringelheim established the endowed Ted Ringelheim Life Skills Fund to give student-athletes training in financial literacy and social etiquette. “I wanted to extend a big thank you to AU during my lifetime and now have the pleasure of seeing AU student-athletes mature through the life skills program,” Ringelheim says. He also made provisions in his estate plans to enhance the Life Skills Fund and to create an additional endowed fund, this time to support a student scholarship for those pursuing a degree in history. American University is grateful for Ringelheim’s foresight, enthusiasm, and lifelong commitment to students. Scores of AU Eagles will benefit from his generosity—on the field, in the classroom, and beyond. You can follow in Ted Ringelheim’s footsteps and support your AU passion. Contact Seth D. Speyer, at speyer@american.edu or 202-885-3411 today to explore your options. Contact Seth D. Speyer at 202-885-3411 or speyer@american.edu to discuss endowed gifts.